A while ago I reviewed the Taylor GS Mini mahogany model – and was genuinely blown away by it. So, I thought it might be nice to compare the GS Mini (Spruce) to the GS Mini Mahogany. This review will cover what the actual physical differences are and what the tonal differences are. There is literally only one difference between these two models. So, what a great way to test between a guitar with a mahogany top and a spruce top. Let’s take a look at the things that are the same just to illustrate how similar these guitars are besides their top. And these are just some of the things. Literally everything else is the same. These two guitars play exactly the same. Which is that they play nicely, IMO. I really enjoyed playing both of these guitars (they are one in the same playability-wise). And no surprises that they play exactly the same, given that they are exactly the same except for the top wood. The space in the higher frets became a bit of tight squeeze for my fingers, due to the shorter scale length, but overall just really easy and nice to play. The differences were, to my ear anyway, about what you would expect them to be when comparing spruce and mahogany. The GS Mini Mahogany has a narrower range of tone. It has a warmer tone than the GS Mini and expresses more emphasis on the mid range and has less range/clarity in the high-end and low-end. But all of this is very subtle. 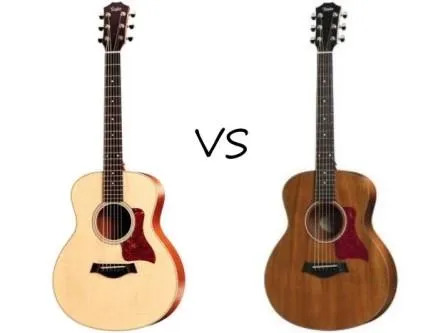 Both guitars are quite warm sounding and really at the middle range between bright and warm – with the GS Mini Mahogany being on the warmer side of middle and the GS Mini probably smack in the middle. If you wanted to go for something a little brighter, then the GS Mini-e RW (with laminate Rosewood back and sides) would give you a bit more brightness/clarity in the lows and highs – if that’s the thing you’re going for. Both of these guitars pack a punch for their size. They produce a tone significantly louder than what I was expecting for the size. And they are super responsive to even the lightest touch (which I would expect from this size of guitar). Who are These Guitars Best Suited to? These guitars are great for a number of different people. I’m a man who loves mahogany – so if I had to choose between these 2 it would be the GS Mini Mahogany. It’s got such a nice warm balanced tone, heavy on the mid-range (which I like) but still has a kick to it and is very responsive to a light touch. But which one you think is better really comes down to personal preference and, like I said above, they are only really subtly different in tone. Overall, these are very affordable (USD MSRP $658 for the two guitars featured in this post [$499 in reality], more for the models with ES2 electronics and up to $988 for the Koa version) guitars given their quality of tone and playability. If you wan to learn more about the GS Mini or GS Mini Mahogany, or are ready to buy or want to research availability and pricing (guitars usually come in at less than their MSRP), check out the links below. If you want to check out my review of the Taylor GS Mini Mahogany, check out the next link. This is very helpful to me (thanks!) and confirms what I have heard on a handful of YouTube videos (both of each guitar, separately, and both compared back-to-back). But the one comparison I haven’t found anywhere yet is between Walnut and Mahagony. Like you, I think I prefer the Mahogony over the Standard, but it appears that the Walnut has a bit more sparkle and bite to it than the Mahogony while being similarly warm and punchy. Have you ever had the chance to play the Walnut back-to-back with the Mahogony? What are your impressions on that? And which one of the three (Standard included) do you think would sound the best when always tuned down a full step (in D instead of E)? Which one would not bottom out in terms of bass or have too little sparkle and shine? I haven’t played the Walnut version unfortunately. I have now played the Koa model – and that was probably actually my favorite. Without actually having played the Walnut version, I would say that both the Walnut and standard version would probably have a bit more sparkle when tuned down. The Mahogany might get a little too muddy tuned down. I couldn’t say this for sure, having not actually done it – but this would be my guess. The Koa would probably retain a bit more of that sparkle tuned down as well, as opposed to the Mahogany top. That’s just a guess as a. I haven’t played this guitar tuned down and b. I haven’t played the Walnut version.